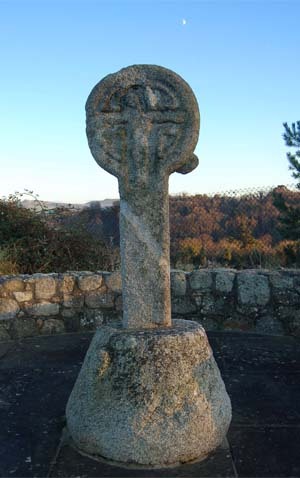 There are a number of crosses located in the Rathdown area known as the Fassaroe Crosses. It has been suggested that these crosses may have been carved by the same stonemason. The tallest of these crosses is the one from which this distinctive group gets its name, St Valery's Cross at Fassaroe, Bray. The cross stands at 1.42 metres high and is 16cms in width. The Western face bears a crucifixion scene and the eastern face bears two very worn human heads. There are two other heads on the cross, one can be seen protruding from the south edge of the ring and another is situated on the north eastern side of the base. A large diagonal band of quartz runs through the shaft of the cross. 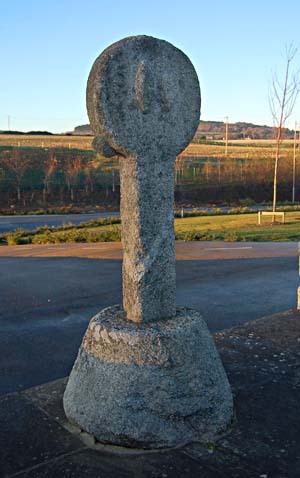 Another Fassaroe cross at Kiltuck is also featured on this website. Situated: From Dublin head south on the M50 just after the end of the M11 motorway take the exit signed Fassaroe then a right at the roundabout, drive over the M11 and straight through at the next roundabout, at the next junction turn left, the Cross is situated to the left of the next roundabout. Discovery Map 56: O 2425 1778. Last Visited December 2008.